Athena looks out the family room window. I love watching birds at my feeders. It's mesmerizing and fascinating. In a post a few months ago, I included quite a few photos of some of the different birds that come and feast. But it's not just avian critters that partake of the lovely buffet I lay out daily. There are a few uninvited guests. Pondering which feeder to plunder. And no, they are not on the guest list, but somehow they get past the bouncers at the...well, maybe that's the problem. There is no door to my backyard. Though, even if there were, I am sure squirrels would find a way over or around it. And while my dogs could be qualified as bouncers (particularly Jasper and Tucker, who can be very Bouncy), they are not on Outside Duty all the time. Not that I mind them that much. They are kinda cute. Particularly when they sit on their hind legs, holding their little paws in front of them and ask, "What are you looking at? And can you bring out some more sunflower seeds? You're running low." Squirrel on the window feeder: "You're running low on seeds here. Tell management we need a refill." 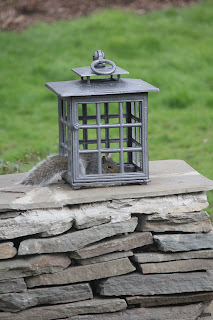 The little bushy-tailed rodents do provide endless entertainment for my furry family members. 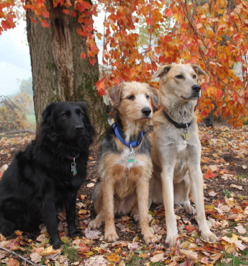 For the dogs, squirrels are just irresistibly chaseable. And I'm sure the cats would chase them, too, if they were allowed Outside. But even if you can't chase 'em, you can watch 'em. And I have set up my family room with a bench seat right in front the windows that overlook my garden and feeders. I even have a few feeders stuck right on the windows, for an up-close and personal view of the brave birds that stop to eat there. I picked up this cool lantern at an estate sale, and was about to put the candle inside when I came up with the brilliant idea of putting bird seed in instead. Then the birds could get in, but the squirrels...nevermind. Dawn and Athena love the bench, and spend many hours watching Kitty TV, which I'm sure they believe is tuned to their favorite channel of Birds and Squirrels--and Chipmunks--simply because they are Cats Who Must Be Served. Benched: Athena and Dawn watchin' Birdies and Squirrels. Athena will Hunt the Birds and Squirrels she sees. 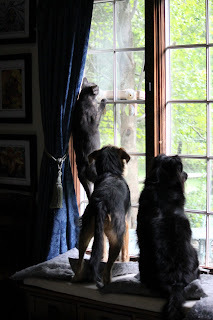 Back when I still had crosspieces on the windows, Athena would leap up at the Birds--or Squirrels--on the window feeders, and hang on with her claws until they flew or jumped away. Usually Birds startle and flap away in a satisfying swirl of feathered fury. But Squirrels learned very quickly that the pounce was ineffective and would ignore her, except perhaps to stop eating and stare back at her. "You lookin' at me? You lookin' at ME?" Athena would drop from her hanging position in disgust. Athena has just leaped up to scare away the Squirrel on a window feeder, and is hanging on the cross pieces. Tucker would love to do the same. Lilah is just watchin'. And I'm still trying to decide if it's sad or humorous as Athena still leaps at birds and squirrels even after I removed the crosspieces. Of course, there is nothing to hang onto, and after she leaps up to the feeders, she slides down the window in a cartoonish whoosh. Lilah also likes to watch the Birds and Squirrels. She'll chase them when she's Outside, but when she's in the house, she knows there's no way to actually Get the Squirrels, so it isn't worth the effort to jump at them or bark at them. However, that is a lesson that is lost on her brothers. Jasper and Tucker really Want Those Squirrels. And they both Know they Could Get Them. They Could. So they have to Bark at them. Because there are Squirrels. And they're Out there. Being all Squirrelly. The operative word in the previous sentence: "working." When Tucker is at Camp Bow Wow, and therefore not around to egg Jasper on, the excitement level is a little lower--as in, I'm not as afraid he's going to crash through the window. But he does make it clear that he is on the wrong side of the glass barrier. In the short video (only 50 seconds) below, you can hear Jasper's commentary about the squirrels he sees. Make sure you have sound on when you watch it, because the fun is in Jasper's discourse. Oh, and I've added subtitles for those who don't speak Dog.